The Model 6331 Plastic Metric Rain Gauge measures up to 280 mm of precipitation and is made of clear, tough butyrate. The internal measuring tube, with a capacity of 25 mm, is graduated to 0.2 mm. The Model 6330 Stratus Rain Gauge measures up to 11 inches of precipitation and is made of clear, tough butyrate. The internal measuring tube, with a capacity of 1 inch, is graduated to 0.01 inch. The EAR10 Emergency Alert Radio with Weather allows the user to program the radio so that it only alerts for the desired warnings in the selected county. Plan the day with confidence with your own accurate and up-to-date rainfall information – right from your own backyard. The Midland WR-120EZ Public Alert Radio has an innovative warning system that automatically activates when severe weather or other emergencies threaten your local area! This desktop Public Alert Certified Weather Radio from Midland eliminates false alarms and notifies you of alerts for tornadoes, hurricanes, ice and snowstorms, floods and much more. La Crosse 308-1414B Wireless Color Weather Station provides precise, real-time weather data straight from your backyard. La Crosse 308-1414MB Wireless Color Weather Station with Mold Indicator provides precise, real-time weather data straight from your backyard. The MK-III Mono Mount is constructed from powder coated steel, aluminum and PVC. This mounting system is durable and stable. The slender design is simple and unobtrusive and is aesthetically pleasing. The adjustable base of the mount van be adjusted to mount on any pitch roof. This mount is designed specifically for the MK-III sensor assembly. La Crosse Technology® introduces a Wireless Color Weather Station with precise, real-time backyard weather. Kestrel 1000 Pocket Wind Meter Whether it's in your room or those of your children, in the living room or the kitchen, thanks to the Netatmo Weather Station and its Additional Units, you can measure the temperature, CO2, and humidity throughout the entire house. Netatmo Rain Gauge has an easy-to-read rainfall display and warns you the moment it starts raining. The Model 8226 Davis CarChip Pro is like a tiny "black box" or data logger for your car. Oregon Scientific RGR126N Wireless Rain Gauge with Outdoor Thermometer features a self-emptying rain collector with wireless transmission of up to 300 feet unobstructed! Our new Remote Monitoring Weather Station features wind speed, rain, indoor and outdoor temperature and humidity data, daily high and low temperature records, dynamic forecast icons, and a new Wi-Fi connected option. The Davis Instruments Model 6351 Wireless Vantage Vue Console/Receiver can be used as a replacement for your Vantage Vue console or as an extra console for monitoring in an additional location. It can also be used to monitor data from the Vantage Pro2 Wireless Weather Stations. The Davis Instruments Model 6351M Metric Wireless Vantage Vue Console/Receiver can be used as a replacement for your Vantage Vue console or as an extra console for monitoring in an additional location. 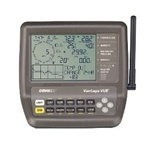 It can also be used to monitor data from the Vantage Pro2 Wireless Weather Stations. Netatmo lets you monitor your home environment from anywhere in the world. A precise and attractive Temperature Compensated 6.5" Solid Brass Case Barometer. The dial face reveals a polished German movement, the heart of an accurate aneroid barometer. Quickly changing weather conditions require constant, immediate updates. Measure wind speed, temperature, relative humidity, dew point and wet bulb temperature with ONE instrument. The Certified Hygrometer Model HTAB-176 is certified to be accurate within ± 3% RH. The dial indicates the complete range of 0 to 100% relative humidity and 0 to 210 Fahrenheit with a ±1% accuracy. Kestrel 3500DT Pocket Weather Meter Harbormaster is an east coast tide clock with a patented quartz movement A beautiful Lufft temperature and humidity instrument with an easy-to-read face. Plan your day with confidence with your own weather and weather prediction information – pinpoint accuracy right from your own backyard Judging the danger of lightning used to be guesswork. Now with the Model P5-3 SkyScan Lightning Detector, it's just a simple matter of pushing a button. The Kestrel 5000 Environmental Meter is a remarkably powerful measuring and data logging tool, yet remarkably compact. Davis Instruments introduces the all new Vantage Vue™ weather station, combining Davis’ legendary reliability and toughness into a station that’s easy to install and use. Davis Instruments introduces the all new Vantage Vue™ weather station, combining Davis’ legendary reliability and toughness into a station that’s easy to install and use. Vantage Vue is fully featured, highly accurate and affordably priced. It has frequency-hopping spread spectrum radio technology, wireless transmission up to 1,000 feet (300 m), weather updates every 2 ½ seconds, a glow-in-the-dark user friendly keypad, on-screen data graphing and numerous other useful features. The Model 6250M Vantage Vue measures in Metric readings. The world’s most complete weather meter AND the world’s most portable weather station. 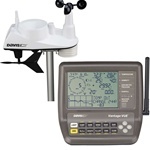 The 6152 Davis Vantage Pro2 wireless weather stations are better than ever. The only weather station to use frequency hopping spread spectrum radio, the Davis Vantage Pro2 Weather Stations can transmit and receive date up to 1000'. You will get all current weather conditions including; wind speed anemometer with wind gust, wind direction, outside and inside temperature and humidity, barometric pressure, rainfall, a weather forecast and much more! The Vantage Pro2 Weather Stations are simply the best weather stations. The 6152 Davis Vantage Pro2 wireless weather stations are better than ever. You will get all current weather conditions including; wind speed anemometer with wind gust, wind direction, outside and inside temperature and humidity, barometric pressure, rainfall, a weather forecast and much more! Maestro displays wind speed, wind direction and highest gust up to 100 MPH (and 160 km/h). Wind speed is self-powered by rooftop sensor. Wind direction is displayed across 16 compass points using LED’s which run off the supplied AC power pack. The new StormPro2 storm tracking system utilizes ground-breaking new technology and represents a quantum leap forward in storm tracking capabilities. Montauk Brass Weather Station The Model 410-C Weems and Plath Classic Barograph is a wonderful way to keep records of barometric pressure. High performance, rugged corrosion-resistant construction, and handsome satin-finished mahogany cabinet qualify the Atlantic for use offshore as well as at home.